It's alive.......and huge!!!! 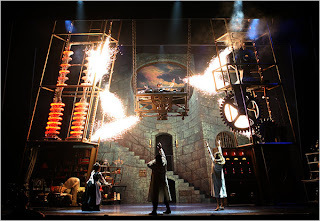 Well, I mean the set of this musical which now plays at the Hilton Theatre. Coming into the theatre, you know exactly where the money you paid for the ticket goes. Lani and I saw it last Sunday matinee.....on her birthday. This is a straight adaptation of the movie with songs injected to it. 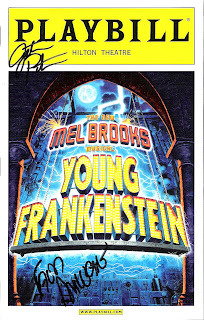 But I must say it did have an amazing cast Roger Bart (Dr. Frankenstein), Megan Mullaly (yes, Karen Walker of Will and Grace; she plays Elizabeth), Shuler Hensley (the monster), Andrea Martin (Frau Blucher) and Broadway's "it" girl, Sutton Foster (Inga). The whole cast was great but the show is just not for me. I'm not a Mel Brooks fan except for Space Balls and I actually thought "what's the big deal" when I saw The Producers. The jokes were typical slapstick and I thought some of the numbers were stretched out (I think Lani agrees with me) and in the middle of the show my eyes started to get heavy as if I was going to fall asleep! The only time that happened to me was when I saw Phantom! Don't get me wrong, it's still an enjoyable show but not amazing.....it was just ok for me. The highlights were Sutton Foster's yodelling and the Puttin' On the Ritz number. I was glad to see a tap number with that song but the ensemble couldn't really show off their detailed tap choreography because the number called for them to wear platform shoes. It was difficult to get taps wearing those shoes! It was also nice to finally see Roger Bart and Megan Mullaly who both had really good voices. We did stagedoor but most of the principals didn't come out because someone said they had a guest visit backstage. I wonder who that was? I don't know who the the guest was backstage, but apparently none of the principals come out through the stage door anymore except Shuler Hensley. Megan Mullally and Roger Bart both sneak through the front door (of course, where they would be least expected)and apparently there are 12 other exits out of the theater. I was at the stage door four nights in a row and each night Shuler was the one who came out. Although I catch Megan coming out the front the last night I was there, and she was with Carly Simon!